Former Union minister and BJP parliamentarian Sanwar Lal Jat died at the All India Institute of Medical Sciences (AIIMS) in New Delhi early on 9th Aug 2017. He was 62. 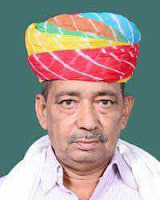 The Rajasthan politician, who had served as the minister of state for water resources in the Narendra Modi government, breathed his last at 6.15 am after being in coma for over a week. A five-time MLA, Jat was a mass leader and a close confidant of Rajasthan chief minister Vasundhara Raje. Born in a peasant’s family at Ajmer’s Gopalpura village, the politician made his Lok Sabha debut in 2014 by defeating Rajasthan Congress president Sachin Pilot from Ajmer. The chairman of the state farmers’ commission, he frequently raised rural issues - mostly related to agriculture - in the Rajasthan assembly. Jat was a farmers’ leader who had made an immense contribution to the state as MLA, MP and minister.